This is the third novel by Emma Kavanagh and the third novel of hers I have read. I just love her work. You can find my thoughts on her Debut, Falling, Here and the second novel, Hidden, Here. Kavanagh has a wonderful way of describing events that make you understand and feel it as she wants you to. 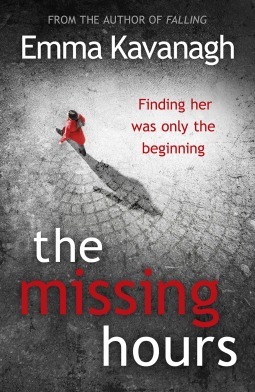 In The Missing Hours, a woman disappears and returns some time later. The story is told from two points of view, that of brother and sister detectives. They are working together but separately on the investigation and it gives you the ability to see a larger story but with the help of two great characters. I’m not sure if Kavanagh is considering a series, but I could definitely read more from the two detectives in this book. They have solid backgrounds that make the characters real without overtaking the story. The missing woman and her family are intriguing. Kavanagh even breathes life into the woman’s dead husband through information learned about the family and family business. It’s a good novel when the dead character is written so well that they don’t feel like a bit part which would be so easy to do. It’s an interesting story as Selena (the missing woman) and her dead husband have a company dealing with kidnap for ransom as readers who will have read Kavanagh’s short story; Case 48: The Kidnapping of Isaiah Rae, where they were both introduced. The kidnap for ransom world is fascinating and adds a great layer to the story. Another corker from Emma Kavanagh. Next > Cover Reveal – Made To Be Broken! I keep hearing such great things about this one, Rebecca. Certainly it’s a really interesting premise! And the idea of brother/sister detectives, each working the case in a different way, is intriguing. Glad you enjoyed it so well. It’s the first time I’ve come across brother and sister and I really enjoyed the dynamic it provided the book. I would love to see them both again in another. I hope she does bring them back. Ooh, I’m afraid I’m a spine cracker. Nothing I love more than actually getting comfortable with a book! But yes, I think you’ll enjoy this. Emma’s writing is flawless as always and it’s a great story. It’s a great book, but I am biased towards Emma’s books anyway. I just love her way of writing. So descriptive and beautiful. Really pulls you in.